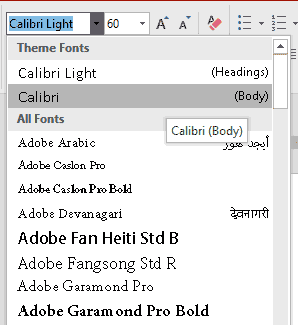 You all know that you can easily change the font for any selected text in PowerPoint, by choosing any installed font on your system. But did you know that you can use fonts that don’t exist on your system! This is either a trick or a bug and is similar to the analogy of a glass, half full. Some would complain about the glass being half-empty while others would be satisfied with the glass being half-full! In other words, this is a two-edged sword. I heard about this trick from Steve Rindsberg, who credits it to a post on Microsoft Answers. John Wilson and the original poster answered the question, and Steve further refined and added some details. Select some text. Either select some text or select the entire text container (text box, placeholder, or shape). 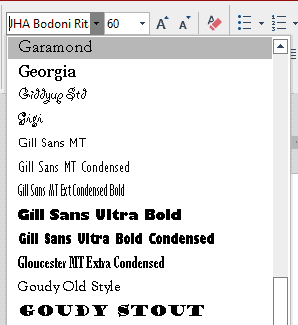 Now go to the Home tab, locate the Font group and click in the Font dropdown list, as shown in Figure 1, below. Now start typing any font name you want. Essentially, as you type a name, the closest installed font name shows up. But we have no intention of choosing an installed font. So we typed in JHA Bodoni Ritalic, as shown in Figure 2, below. Press the Enter key on your keyboard to set this font for your selected text. Is There a Font Called JHA Bodoni Ritalic? Yes indeed! Since we had to use a font that was not installed on our system, we decided to find out the most expensive font available. Would you believe that JHA Bodoni Ritalic costs $5000! 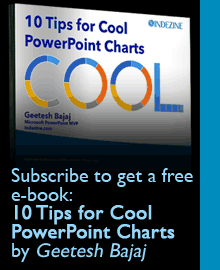 Thankfully, you don’t need to get this font to follow this tutorial. You may get a warning message (see Figure 3) that says, “If you continue, “JHA Bodoni Ritalic” will be saved as the current font. This font isn’t available on the device you are currently using, so another font may be used for display, for print, or both. Do you want to continue?” Click Yes to continue. Thus you end up using a font that’s not even installed on your system. Now if you remember, we called this technique a two-edged sword. So what are the pros and the cons? Now to end on a happy note, if your high net worth client has a license for JHA Bodoni Ritalic or a similarly expensive font, then at least you can use that font even if you don’t have it installed. Make sure you have another copy of the presentation with an installed font, so that even with your client happy, you can still go back and make edits to the slides. And try and use a font that looks similar to your non-existent, non-installed font!